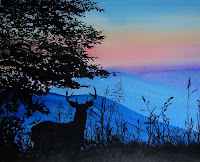 Now that I've found a little spare time, thought I'd share my little technique for inexpensively customizing our mountain condo's decor: adding animal silhouettes to just about anything that needs a bit of pizazz. I have enjoyed painting detailed pictures of animals, flowers, etc., on things in years past; but sitting down and painting a portrait of a songbird on fencepost takes more time than I have these days. So I've found a quicker, easier and almost-as-satisfying technique for getting those realistic images from nature onto the various items I wish to decorate. And I don't spend money on expensive stencils or rubber stamps to do it either. One. Something to decorate (preferably an old wooden item you already own, a cheap item you found in a charity shop or rescued from the garbage, or something you found on clearance at a hardware store or Walmart. I find going to a craft store to buy a brand-new unfinished box or plaque, or whatever, to decorate greatly undermines my enjoyment of a project. 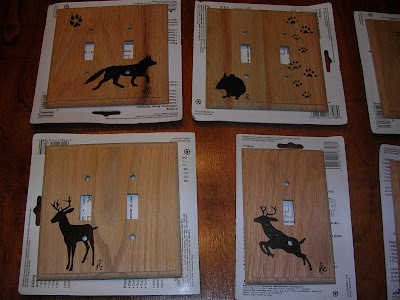 For this example, I will use some wooden electrical outlet cover plates I found on sale at Walmart - and also a wooden tissue box cover I found at my local Goodwill. Two. A photograph of some plant or animal you like the look of, printed onto a sheet of regular printer paper AND some carbon paper. (This is getting harder to find, since typewriters aren't used as much these days.) 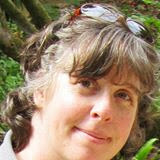 I usually turn to the Internet for my images, but you might have a photo of your own. (If it's on thicker paper, just scan it in and re-print it on thinner paper.) If you can, try to find a photo where the figure is either superimposed on a white background or with all its edges against a lighter background so they are easily visible. Also, you might want to do a trial trace of the figure, to make sure that the outline actually is identifiable to others. That cute photo of a baby bear might just leave folks (who haven't had the benefit of seeing the original photo) wondering why there is a black blob painted on the backs of your chairs. My family members have gotten used to impromptu "Rorschach tests" which usually involve my popping into the room waving a piece of paper under their noses, asking "What does this look like to you?" My husband, without hesitation (This is important. ), replied "a mouse." when I tried an outline of this example's image on him. O.K. Where was I . . . ? Ah, yes! Three. A fine-tipped brush (and maybe a larger one, depending on the size or your chosen image), some black paint. 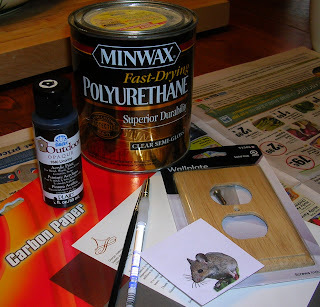 I used acrylic craft paint here; but really, use whatever paint your chosen item's surface demands. Perhaps you're trying this on metal, fabric, or plastic? Do your research so your design doesn't easily scrap off once it has dried. ( Someday, I'd like to try etching cream on glass.) Oh, and some masking tape to hold things in place while you're working. O.K. 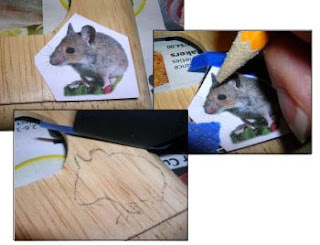 It's probably apparent to you that I'm merely using the carbon paper to transfer my marks to the surface of my outlet cover as I trace around the perimeter of my printed out mouse photo. Simple, simple. I'll just add a couple of little hints to save you some trouble: If the surface of whatever you are working on has any gloss, you may want to go over the area with a bit of sandpaper. Bear down as hard as you can while tracing and maybe mark your lines just a smidge inside the actual outline of your image, so you can cover 'em up with the paint later. Always carefully peek, taking care not to shift your design of course, so you can go over areas that might not have transferred successfully during your first pass. And what's next? Yup. Paint over your lines and inside 'em w/ your black paint. Easily said - and mostly easily done, if you take it slow, have good light and a steady hand. Too many cups of coffee might not help you here. I don't have any really good hints about how to fix it when you mess up. I haven't discovered any cool ways to erase mistakes with a q-tip soaked in some common liquid found around the house. Sorry. That's why you should do this on things that don't cost you much or where there's enough space to cover up your mistake with a larger-sized silhouette, perhaps? Or turn a mistake into a feature: Who knows? If my 6-year old happened to come along and jostle my elbow, this mouse might have acquired a tail. OK, after you've gotten the painting done to your satisfaction, you'll want to let it dry fully (overnight's usually enough time); and then move onto the boring part of thinking about the practical measures of preserving your work. 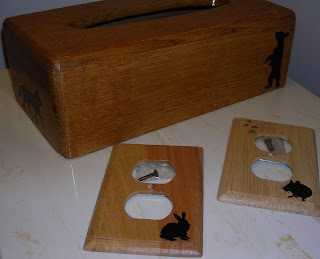 In cases when I decorate wooden items that are likely to be touched a lot, I put a couple of coats of polyurethane on to protect my handiwork (obviously, not doing any sanding in between coats, at least not over the area with my design). I can report that the polyurethane does not react with the acrylic paint and cause it to smear while I apply it; but this is something you'll need to be cautious about if you're working with any other kinds of paints and clear coating products.